Scan Copyright © bayswater97 (Scott) on Flickr. All rights reserved. 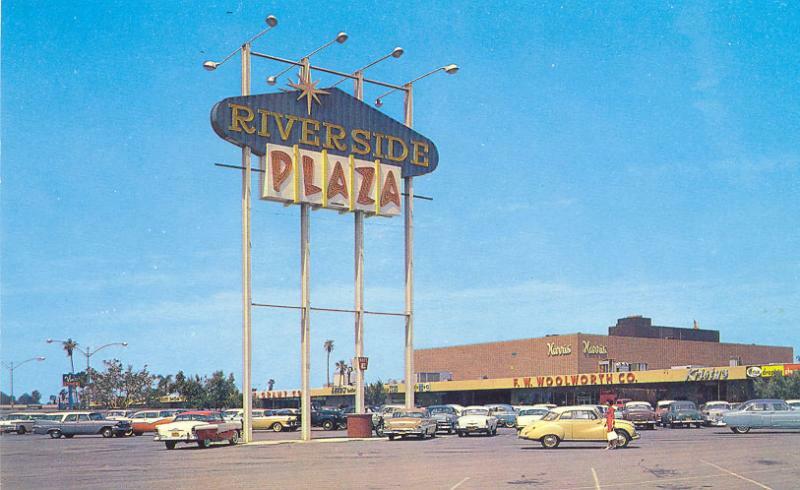 Riverside Plaza is still around but, of course, looks nowhere as cool as this. The Harris’ in the background was featured here previously. Posted in 1950s, Retro/VintageTagged Americana, center, centre, googie, mall, neon, nostalgia, postcard, shopping, SoCal, starBookmark the permalink. Meagan…no, I don’t sell prints of this as it is not my scan. The Flickr member bayswater97 (Scott) is linked below the picture. He’s the person that created the scan. It would be best to ask him. I know at one time that Flickr allowed folks to order prints directly but I do not see that feature there at this time. I sure can’t blame you for wanting a printed copy of this. It’s a real beauty.